Scale models of the Orion crew exploration vehicle recently were tested at NASA's Neutral Buoyancy Laboratory, or NBL, at NASA's Johnson Space Center in Houston and at a wave tank at Texas A&M University in College Station. 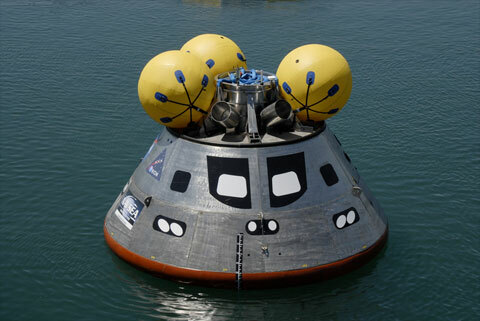 NASA conducted a series of buoyancy and flotation characteristics tests using the NBL and a 1/4-scale model of the Orion crew capsule. The model was lowered into the NBL's 6.2-million-gallon pool and was floated in a series of positions. 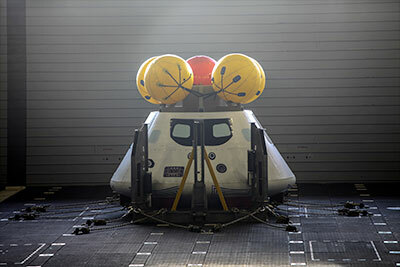 This testing will allow the engineers and the NBL team to develop their full-scale crew training mock-up that will be used for mission training and for creating the crew safety procedures for water-based landings of the Orion crew capsule. The team also performed a series of tests to validate a new seal design and updated wireless communications. Engineers also evaluated a prototype floatation collar for the spacecraft, which was provided by NASA's Kennedy Space Center in Florida. Above: A 1/4th-scale model of the Orion spacecraft is lowered into the 6.2-million-gallon Neutral Buoyancy Laboratory at NASA's Johnson Space Center. Engineers used the test to gather data on how the model behaved and reacted in the water. 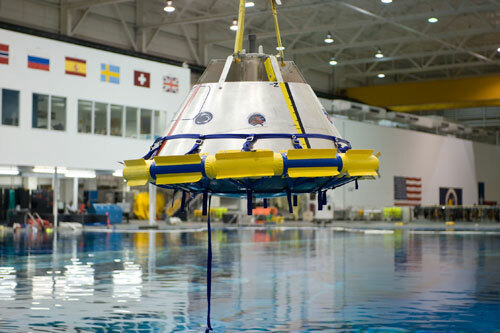 "It is rewarding to see an actual scale model of Orion finally being tested in the water," said Alan Rhodes, a NASA engineer who was observing the testing. "The NBL is a one-of-a-kind testing facility for NASA, and the team helped us gather a tremendous amount of critical data that we will use to refine the design of Orion." A smaller scale model of the Orion crew capsule also was tested at a wave tank at Texas A&M University. 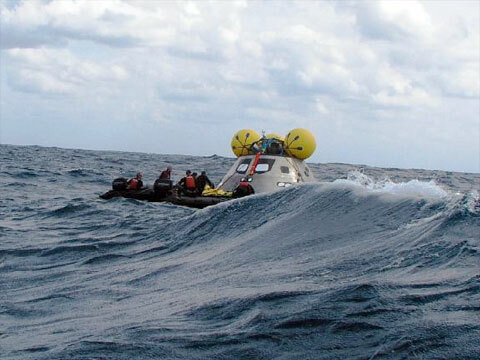 The goal of the test was to determine how the spacecraft reacts to strong waves while it floats in the water. Engineers simulated gale force winds and large waves to ensure the spacecraft would remain upright. 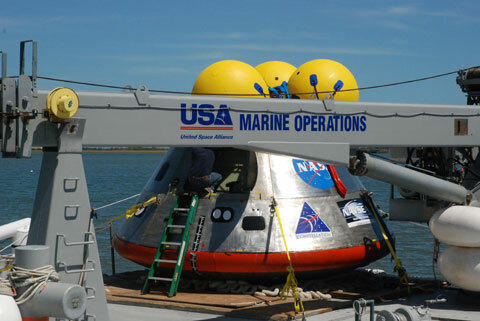 The next step for the team will be to partner with a team of naval architects from the United States Navy to conduct a series of flotation characteristics and towing tests to help further understand how the Orion crew capsule will act in different sea states and to help generate recovery procedures. The next round of testing will be held in October at the Naval Surface Warfare Center in Carderock, Md., and at the Aberdeen Proving Ground in Aberdeen, Md. 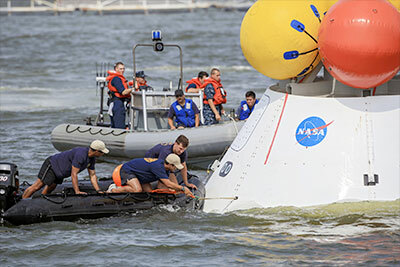 Along with the scaled testing, NASA and the United States Navy began fabrication of a full-scale test article that will allow search and rescue divers from the Human Space Flight Support team at the Kennedy Space Center to begin working with an Orion mock-up in the water. These tests will allow the team to review current recovery procedures and to understand how changing sea states will affect the overall recovery operation. Full-scale testing will take place off the coast of Florida, near the Kennedy Space Center, in January 2009. 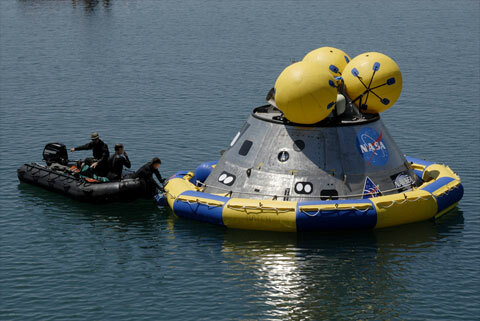 A full-scale mockup of NASA's Orion crew module is being tested in water under simulated and real landing weather conditions. 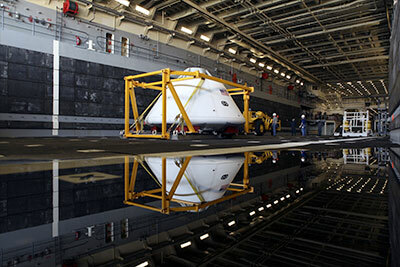 Beginning March 23, a Navy-built, 18,000-pound Orion mockup will be placed in a test pool at the Naval Surface Warfare Center's Carderock Division in West Bethesda, Md. 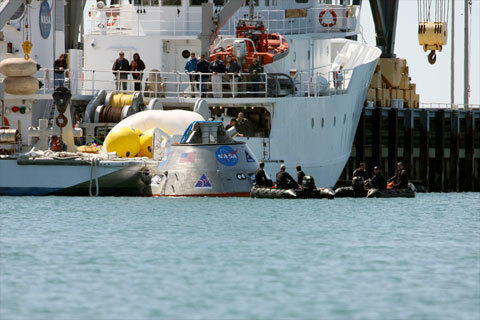 Ocean testing will begin April 6 off the coast of NASA's Kennedy Space Center in Florida. Was the capsule weighted as if it were returning with 4-6 astronauts? And has NASA settled on water landings? NASA's press release mentions the mock-up weighed 18,000 pounds, which is, I believe, consistent with the target landing mass. And yes, a water landing is now the nominal return option. ...and during a test in the open waters of the Atlantic Ocean. Has there been any research or experience as to how long duration astronauts returning from ISS will react to the planned ocean landings? Obviously, it's not the ideal way of coming home, I just wonder if the control panels of every returning Orion ship will be covered in, well...lunch. That last photo brings back fond memories! 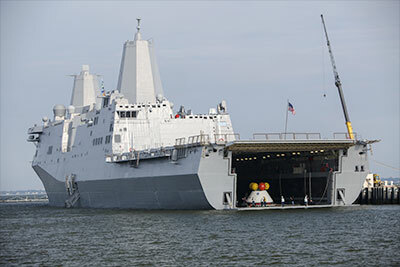 Photos show a mockup of Orion being towed to the San Antonio-class amphibious transport dock USS Arlington (LPD-24) at a pier at Naval Station Norfolk in Virginia. The Orion will be floated into the well deck of the Arlington and the water will be drained so the capsule remains in a safe, dry environment and future astronauts can exit the spacecraft. Navy Live, the official blog of the US Navy, will carry live coverage of the recovery tests beginning at 12 pm EDT, and has an article by the CO of the Arlington, its role in the tests, and mentions a past predecessor ship's part in the Apollo program. At the Naval Station Norfolk near NASA's Langley Research Center in Virginia, NASA and Navy personnel practice procedures during a stationary recovery test on the Orion boilerplate test article. 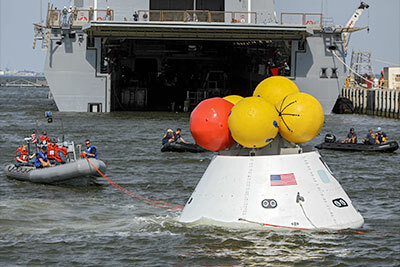 NASA and the U.S. Navy are conducting tests to prepare for recovery of the Orion crew module and forward bay cover on its return from a deep space mission. The stationary recovery test will allow the teams to demonstrate and evaluate the processes, procedures, hardware and personnel in a controlled environment before a second recovery test next year in open waters. Fascinating to see the choreography involved in this procedure for ocean recovery. As I heard one of the Navy officers explain it, the zodiacs and other small boats will tow an Orion near the well deck, where lines will be attached to keep the capsule steady and taut until a cable winch can be hooked on to bring the capsule into the deck. The first part of the operation will be monitored by an officer in 'Well Deck Control', while the recovery efforts inside will be supervised by a boatswain's mate. If anyone missed today's test in Norfolk, it will be put in Navy Live's video library in about two hours. Main canopies and lines are going to have to be recovered/locations accounted for before that Gator can close for the tow else they risk fouling the screws. As already commented, the pictures of a sea recovery bring back memories of Apollo. This raises a question. Though the fine detail will obviously be different, how much spill-over from Apollo will there be in the broader princlples of this type of recovery? Take away the ocean and US Navy, almost none. Not a carrier task force, just one ship. Few airborne, assets which are mostly for IR and video documentation. The contractor has a larger role in handling the capsule once it is on the recovery frame. Cost was a driver. Does anyone know what contingency plans there will be in case the Orion capsule lands a long distance from the expected recovery point. And what if an emergency situation occurs under such conditions? Will there be contingency aircraft with swimmers aboard on standby for such an emergency? And what if the capsule is forced to splash down in the wrong ocean? Surely, at least for manned missions, there will need to be a second ship standing by in the opposite ocean for just such a situation. These are the broad headlines. Surely, some of these will have relevance to Orion though, as I said, the fine detail may well be different to a greater or lesser extent.